One of the Jeep things drivers understand is that asphalt is an alternative. Unlike most vehicles, Jeeps are made to handle a variety of driving surfaces, from dirt roads to riverbeds. We know Jeep drivers, and we know they love how their Jeeps can get them anywhere they want to go, whether it's a secluded fishing spot or an elevated summit with an incredible view. They are proud of how their Jeeps can keep going when the road stops. Put your go-anywhere attitude where everyone behind you can see it. 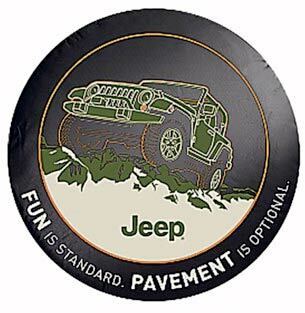 Show off that pride with a Jeep tire cover displaying the message, "Fun is standard. Pavement is optional." It features a graphic in traditional green and brown tones of a Jeep conquering an off-road incline - the kind of thing a standard SUV wouldn't have a prayer of crossing. Made from a soft-top material, it will fit the spare tire of your Wrangler or Liberty like a glove. It is made by Mopar, the OEM that manufactures the parts you see on the showroom floor, but comes with a deep discount that dealers wouldn't dream of giving. My son likes it . The tire cover was on sale that I purchased from just for jeeps.com which made up for the difference in shipping from other companies that offered free shipping. The cover got to me in good condition and quickly. I love it. The logo on the back funnest standard pavement optional says it all about my new Rubicon. Make it a great day everyone!!! Very tight fit but that's what you want. Good looking quality tire cover, with a perfect fit. ProsEasy installation, well made, perfect fit. I ordered this tire cover for my old Jeep because birds continue to build nest in the spare tire. Hopefully this will solve the problem. I love the look of this one and it matched my old green jeep with the khaki cover. The description matched the cover perfectly and I installed it in a couple of minutes. Received the cover yesterday and it looks great and is of great quality as well. Best price and delivered quickly. Cover fits like a glove. Wish there were more Jeep graphics in color. Well made and distinctive. Everyone likes it!